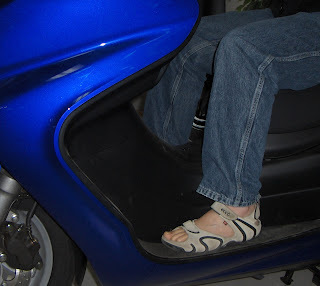 Add Majesty leg shields to your 2005-2011 Yamaha Majesty scooter for all around comfort. Keep your pant legs dry and clean. Leg shields are black plastic, shaped to deflect road spray away from the rider's legs. This keeps you warm and drier. Comes with both a left and right side leg shield. Here's a before and after picture. The blue scooter is without leg shields, the gray scooter with leg shields. We also carry windshields, backrests and other Majesty accessories.